The ambitious and exciting Dawn mission is one of NASA's most remarkable ventures into the solar system. The spacecraft completed a spectacular exploration of Vesta in 2011-2012 and arrived in orbit around Ceres in 2015. These were among the last uncharted worlds in the inner solar system prior to Dawn. They are the two largest residents of the main asteroid belt, that vast collection of bodies between Mars and Jupiter. Ceres is so large that it is included in the category of dwarf planets, along with Pluto. The alien landscapes Dawn reveals provide humankind with a new perspective on the solar system. Remnants from the time that planets were formed, Ceres and Vesta hold clues that will help scientists understand the dawn of the solar system. Dawn is the only spacecraft ever to orbit a dwarf planet and is the only one ever to orbit any two extraterrestrial destinations. It has also maneuvered extensively in orbit to optimize its observations. Such a mission would be impossible without the use of ion propulsion, a technology that has largely been in the domain of science fiction. 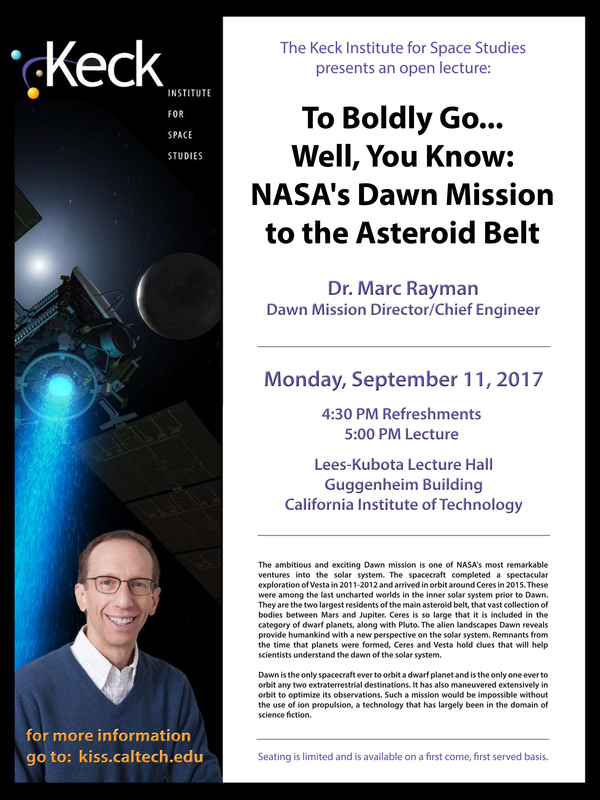 Dr. Marc Rayman will give a fascinating and entertaining presentation on the Dawn mission and its use of ion propulsion as well as its two exotic destinations. He also will share the excitement and profundity of controlling a spaceship in deep space. Marc Rayman grew up in Toledo, Ohio and earned an A.B. in physics from Princeton University. His undergraduate work focused on astrophysics and cosmology. He received an M.S. in physics from the University of Colorado in Boulder, where he conducted investigations in nuclear physics. He then performed research at the Joint Institute for Laboratory Astrophysics (JILA) on experimental tests of special relativity and atomic and laser physics, and received his Ph.D. there. He continued at JILA as a postdoctoral researcher. He spent his six years at JILA working with Dr. John Hall, who subsequently won a Nobel Prize in Physics. Dr. Rayman combined his scientific training with his lifelong study and passion for astronomy and the exploration of space by joining JPL in 1986. His work there has spanned a broad range, including optical interferometry missions to detect planets around other stars, design of a mission to return samples from Mars, a laser altimeter for Mars, the Spitzer infrared space telescope, the development of systems to use lasers instead of radios to communicate with interplanetary spacecraft and more. In 1994, he helped initiate a new NASA program to characterize highly sophisticated and risky technologies for future space science missions by flying them on dedicated test flights. The first mission of this New Millennium program, Deep Space 1, was launched in October 1998, and he worked on it from its inception in 1995 to its conclusion in 2001. During the course of the project, Dr. Rayman served as chief mission engineer, mission director, and project manager. The new technologies that were tested on DS1 (including such exotic systems as ion propulsion and artificial intelligence) were designed to reduce the cost and risk and to improve the performance of subsequent interplanetary missions. The primary mission was extremely successful and led to a very productive and exciting extension, culminating in a spectacular encounter with Comet Borrelly that yielded NASA's first close-up pictures of the nucleus of a comet. The spacecraft remains in orbit around the Sun. Now he is both mission director and chief engineer on a mission that built on DS1 to explore the two largest uncharted worlds in the inner solar system. 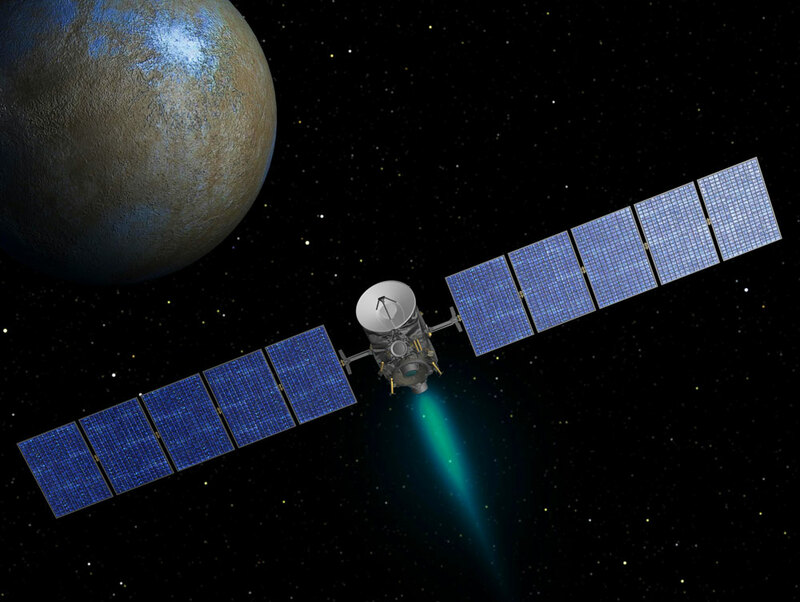 Launched in September 2007, Dawn has orbited two giants of the main asteroid belt, protoplanet Vesta and dwarf planet Ceres, in an ambitious mission to reveal insights into the dawn of the solar system. After a spectacularly successful investigation of Vesta in 2011-2012, it arrived at Ceres in 2015, where it will remain forever. It is the only spacecraft ever to orbit two extraterrestrial destinations. Dr. Rayman is the recipient of numerous honors. His many accolades from NASA include a remarkable three Exceptional Achievement Medals and three Outstanding Leadership Medals, which are among NASA's most selective awards. He was named a JPL Fellow, the highest technical position there, "for extraordinary technical contributions made over an extended period." He is the only person to have received both the Exceptional Technical Excellence Award and the Exceptional Leadership Award, two of JPL’s most prestigious honors. Asteroid Rayman was named in recognition of his contributions to space exploration. On behalf of the Dawn team, in 2016 he accepted the Robert J. Collier Trophy, the most prestigious award in the US for space or aviation. In 2017 he received the Astronautics Engineer Award by the National Space Club and Foundation as well as the Stellar Award from the Rotary National Award for Space Achievement (RNASA).